Dubai Culture & Arts Authority (Dubai Culture) is engaging the public to involve them in strengthening its innovative ‘Dubai ArtBank’ initiative during the 12th edition of Art Dubai. Running till March 24, the ‘Dubai ArtBank’ will introduce an innovative new model for managing art collections and transacting in creativity and art as bankable assets through a new Dubai Art crypto-currency. It is Dubai Culture’s response to the ‘Dubai 10X’ initiative, which seeks to place Dubai Government entities 10 years ahead of the rest of the world in all sectors, propelling Dubai into the future by implementing today what other cities around the world will be implementing 10 years from now. 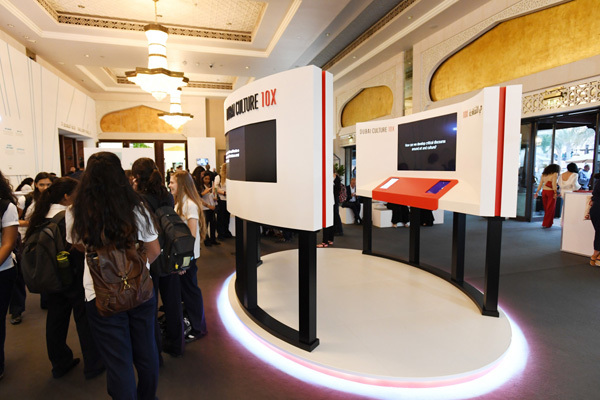 Dubai Culture’s engaging Art Dubai stand features an ‘Ideas Bank’ where visitors can share their ideas about Dubai Culture’s ‘Dubai 10X’ initiative, as well as feedback to a variety of questions related to the arts and culture sectors. The questions have been designed to encourage the public to share their opinions about the ‘Dubai ArtBank’ so that Dubai Culture can develop the initiative in line with the creative community’s needs, and take their opinions on topics including ‘How can we sustain and grow the creative community in the UAE?’, ‘What do artists need to develop their careers?’, ‘How can we develop critical discourse around art and culture?’, ‘How can collections be shared and viewed by more people?’ and ‘What role do you think technology should play in the arts?’. In line with Dubai Culture’s mandate to drive the creative economy, the feedback will be used to support the sustainable development of the local arts sector in the digital era. Art Dubai is an integral part of Dubai Art Season, a citywide showcase of artistic and cultural events which runs throughout March and April under the patronage of HH Sheikha Latifa bint Mohammed bin Rashid Al Maktoum, Vice Chairman of Dubai Culture.